Can I set up one lead scoring rule to increment lead score each time a contact performs an action? Lead scores cannot increment each time the contact performs an action (e.g. clicking on an email). It does not matter how many times the contact performs an action - if the contact meets the criteria for the lead scoring rule, they get the points for that rule. If the contact has Emails Clicked = 1, add 1 point. If the contact clicks a link in another email, they will now meet the second rule, Emails Clicked = 2. They gain 2 points for meeting this second rule, but they lose 1 point because they no longer meet the first rule of Emails Clicked = 1, so their lead score goes up by a total of 1 from clicking in another email. In this way, you can increment the lead score for each increment of the action taken (emails clicked). You can set your individual incremental rules as described above, then set up a rule of, for example, Emails Clicked is greater than or equal to 5 and set a higher value, such as 10, of added points. 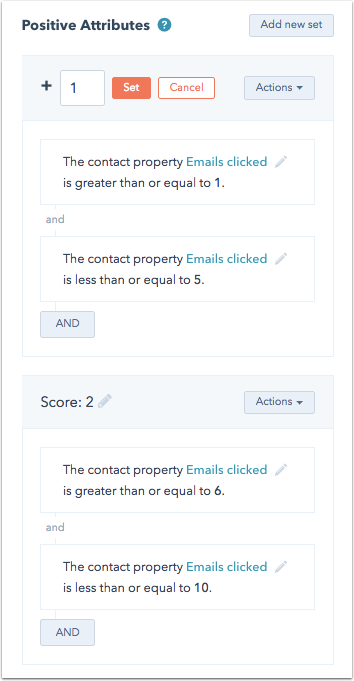 Once a contact reaches this number of clicks, points will no longer be added for additional clicks, but these contacts will have a higher lead score for continuing to click your emails to indicate that they've consistently engaged with your content. When the contact has Emails Clicked = 1 through 5, add 1 point. When the contact falls in the next range of Emails Clicked = 6 through 10, they lose the 1 point from the first rule, and gain 2 points from the second rule, which is a total of 1 more point.